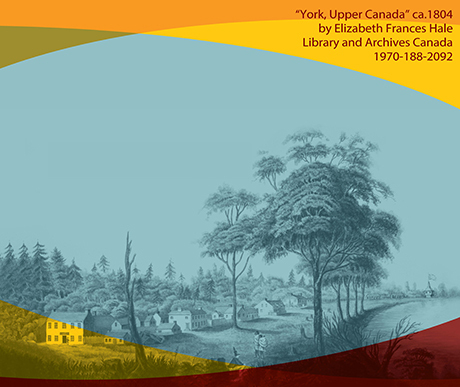 The exhibit Foundations & Fire: Early Parliament and the War of 1812 Experience at York was displayed at the Trust’s Parliament interpretive centre from 2012-2014 and is now available online. It tells the story of Ontario’s first purpose-built parliament buildings and traces the history of the site where they were located (south of today’s Front Street, west of Parliament Street, Toronto) from the late 18th century to the present day. The original Parliament buildings were constructed in 1797, when the Province of Upper Canada (what would become Ontario) was a mere six years old. Within their brick walls, discussions, debates, decisions and laws unfolded that laid the foundations of Ontario society. Foundations & Fire explores key events, such as the establishment of a provincial capital at York, the burning of the parliament buildings by American troops during the War of 1812 (and the retaliatory burning of the White House in Washington), the construction of a second set of Parliament buildings, the Home District Gaol and the Consumers’ Gas facilities on the site, as well as the fascinating archaeological excavations that brought all these stories to light. The exhibit also explores the broader significance of the site by placing these events within the context of the development of Toronto, Ontario and Canada. The range of factors that have shaped the site – from the natural landscape to the socio-economic and political influences of the British, First Nations and the United States – are core elements of our identity and heritage.